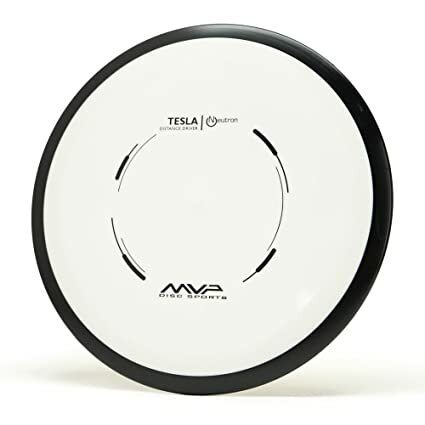 MVP TESLA - The Tesla can be considered the big brother to our acclaimed Volt fairway driver. Choose the Tesla for long-range pinpoint accuracy. STABLE-OVERSTABLE DRIVER - The Tesla's flight path is characterized by its workable turn resistance and provides a fast stable option good for backhand or sidearm throwers. 22 MM CLASS - The Tesla's responsive design balances a subtle turn and reliable fade, while a pronounced glide and forward finish gain extra distance. In recent years, disc golf (or frisbee golf) has sharply risen in popularity as a recreational and professional sport played by tens of thousands around the world. It’s a low-cost, community strengthening sport that currently has over 3,000 established courses. Just like conventional golf, high levels of disc golf play require significant coordination and an intimate understanding of the launched object’s midflight aerodynamics. The following disc drivers have been reviewed as some of the highest-quality and most reliable on the market for hobbyists and pro-level players alike. The MVP Neutron Tesla Distance Driver’s size range is 150-175 grams. The driver’s stability range is classified as stable-overstable, signifying that it should be expected to fly relatively straight while veering slightly to the left. It’s intended to make subtle turns instead of sharp turns, with a fade that can be counted on to follow the general path of the throw itself. Ideally, the driver’s glide should be steady and pronounced while finishing out with enough forward momentum to give it just the right amount of extra distance at the end of its path. 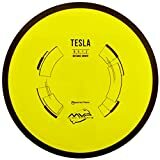 Tesla has manufactured the disc to extend high power and headwind lines, while at the same time, having enough bite to maintain the relatively steadiness of the fade. In addition to keeping the fade level steady, the disc driver’s bite should ensure that the disc driver’s lateral drift is reduced to a level that doesn’t interfere with its overall accuracy. Overall, the MVP is mostly intended to be used by players with high throwing power who are primarily interested in having pinpoint accuracy at long distance. Customers testify the MVP is one of the most reliable overstable disc drivers on the market. One owner testified that the MVP was the very first disc driver that they had decided to seriously invest in, and after using it multiple times, they gradually developed a way to make the disc fit their particular throwing style more accurately. The owner testified that the disc had initially exhibited a bit too much overstability, but after getting acclimated to it, the owner was able to depend on it as a reliable straight driver. Another owner, also a relatively new player to the game, testified that the disc took a little bit of getting used to before they could achieve pinpoint accuracy with it. The owner stated that that, as a newer player, they could couldn’t quite muster up the level of power required to get the driver to their preferred flying height with every throw. Players who are new to the game should be advised that the MVP may demand a considerable amount of strength and precision to reach significant heights while maintaining reliable accuracy. The owner testified that while the disc was undoubtedly of a high quality, they still had to cope with the fact that the disk had a slight habit of hyzering out quickly at the apex of its climb unless they went out of their way to put a serious amount of flex into their throw. Another owner testified that when they threw the disc driver, one of the first things that they noticed was that the disc driver had a slight tendency to cut hard right and then gently float into its destination; because the owner was an experienced disc golf player who could subconsciously account for the midair cutting and adjust their throw accordingly, this was not an issue for them. In another testimony, the reviewer makes a point to strongly emphasize that the MVP is not the type of disc driver meant for beginners to pick up and immediately master. The owner stressed that in order to get the best possible results from the MVP, players will need to have a solid level of power and control in their throw that can truly only be acquired by having several games of experience under their belt. Because the owner was comfortable with a disc driver that behaved in the same fashion as the MVP, they reported that they were able to regularly make the disc fly as far as 400 feet without any significant difficulty. One of the owners had purchased the MVP on the day that it was released, and right away, they noticed that the disc extended the length of their drive by a serious amount; however, the owner did make a point to include the fact that they had been practicing their throwing form for some time. The owner stated that they don’t feel entirely comfortable throwing the disc in tight wooded tunnels, but for open areas, it can’t be beat. The positive testimonies in favor of the MVP were given by both newcomers and disc golf veterans alike. Newcomers, while challenged by the disc driver’s high demand for power and precision, still had good things to say about the disc due to its quality. Veterans praised the disc for being easy to rely on for a flight pattern that responds consistently to throws made with the appropriate amount of flex. It would be wise to ensure that you’re relatively comfortable with your best throwing form in order to get the most out of using the MVP. Each color variation the MVP Neutron Tesla distance driver can be individually purchased for a price that depends on its size. The 150-160g driver can be purchased for $14.90, while the 160-170g and 170-175g drivers are available for $17.49. The Discraft Nuke SS Elite Z Gold Disc is designed as a maximum distance golf driver. 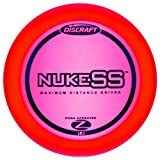 As opposed to golf drivers that are exclusively recommended for those with a high level of skill and experience, the Nuke SS disc is recommended for use by players of every skill level. The stability classification for the Nuke SS is 1.0, making it a relatively straight-soaring disc that can still be anticipated to veer slightly to the left while in flight. As is the case with most disc drivers, the recommended weight for Nuke SS depends on the player’s natural level of power and their unique throwing style. If prospective customers are interested in getting a slightly higher spinning rate, then they’re advised to consider possibly getting a slightly lighter disc. As a heavier disc, the Nuke SS won’t have as much spinning action while flying, but it the reduced spinning is compensated for by a higher amount of stability. Players who are frequently annoyed by their throws getting interfered with by passing winds will benefit the most from the Nuke SS’s bulkier composition. Depending on the height and distance of the throw, the disc might make a slight S-Turn to the left at the end of its trajectory. One owner testified that their overall driving distance greatly improved when practicing with the Nuke SS out in an open park. The owner claimed that with a strong arm and decent form, the average owner should be more than capable of getting the disc to fly at least 300 feet on the first try. Due to the disc having a 1.0 rating in its stability, the owner claimed that they were able to make the disc fly considerably well on a hyzer. When describing the Nuke SS’s flight pattern, the owner reported that the driver will typically flip up straight and veer left at the very end. Depending on the height of the throw, the reviewer stated that the disc will typically fade for about 10 to 30 feet at the very end. The owner went on to state that if throwers are looking to make the disc turn anhyzer, then they’ll have to throw the disc relatively flatly. In another Nuke SS disc customer stated that they had been playing disc gold for over a decade. The highly-experienced player stated that they were very impressed by the Nuke SS’s distance, Elite Z plastic durability, and speed. One particularly positive quality that the owner noted was that a medium speed throw is optimal for creating accurate turnovers. The player stated that they believe the disc is particularly well-suited for owners who have a relatively high level of form and technical accuracy, but may not have yet developed the highest level of arm speed. 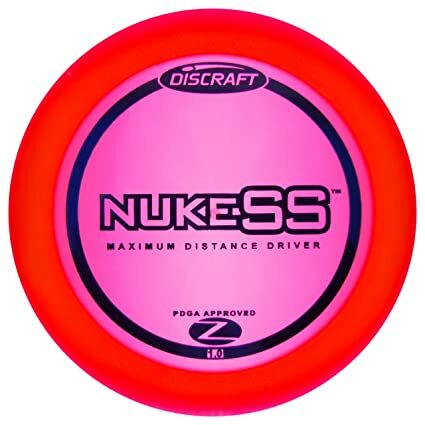 The only potential downside to the Nuke SS disc driver that the veteran player could think of was that the color choices could be slightly more diverse. The majority of customers have testified that the Nuke SS disc is excellent if the thrower intends on making drives that are lengthy and straight. The aerodynamics of the disc make it well-suited for both S-turns and slow turning shots, whether hyzer or anhyzer. The 167-169g drivers are available for $10.99, the 170-172g drivers are available for $12.99, and the 173-174g drivers go for $13.17. The Axiom Proton Insanity Driver is classified as stable-understable, meaning that throwers should expect it to fly relatively straight while veering slightly to the right in midair. The Proton Insanity is Axiom Disc’s very first product in the 20mm Distance Driver class. The Proton Insanity has been popularly described as an MVP Inertia that has been slightly worn-in, with the main differences mostly being a slightly more rapid turning rate and a diminished fade as well. Average power throwers are expected to find that the Insanity should fly relatively straight, while players who have more power behind their throws should expect to be able to easily create accurate turnover lines and relatively precise flips as well. Owners who have an affinity for the “sweet spot” flight of worn discs will be just as well-accommodated as owners who are interested in getting bigger inertia lines without having to use as much power in their throws. One disc golf player testified that the disc’s properties allowed them to get an additional 50 to 75 feet on the average length of their drives. 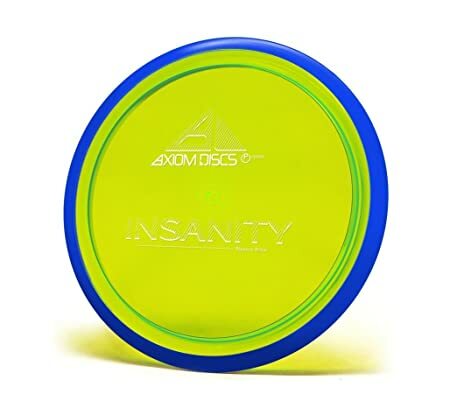 The player testified that out of all of the different disc golf drivers that they had tried, the Proton Insanity was one of the most reliable that they had ever had the pleasure of using on the course. The player stated that their usual throwing style was a right-handed forehand shot, and the discs made their shots as straight as an arrow every time. The owner also noticed that all of their shots with the disc tended to have a slight fade at the very end. Another player stated that the disc was a great choice for any thrower who has the right combination of power and coordination to consistently throw a disc driver straight and far. In addition to praising the disc for its distance and stability, the owner was particularly impressed by the disc’s durability when it came into contact with hard obstacles like trees and signs. Even after repeated collisions with various objects in the environment, the owner testified that the disc consistently maintained its accuracy. One customer made a point to mention that they never had the highest level of arm strength, but thanks to the particularly aerodynamics of the Proto Insanity disc, they were able to get a considerably satisfying distance boost to all of their shots. Another owner testified that the disc helped them successfully birdie several holes that they believe would have otherwise been highly difficult to manage with a disc that doesn’t fly quite as far. The Proton Axiom is particularly well-suited for owners who either want to make their backhand shots curve right and their forehand shots curve left. With enough time taken to develop the necessary finesse, the Proton Axiom can be thrown with the right level of stability to create either neutral straight lines or curving anhyzers. The main trend in positive testimonies for the Proton Axiom’s performance is how it contributes to the overall length of the throwers’ shots. Players whose main challenge lies in getting enough flight length in their throws will be among those who are the most satisfied by it. Out of all the reviews for the disc, the only real downside mentioned was one owner’s personal preference for their disc drivers to be slightly flatter. Aside from possible qualms with the appearance of the disc, there shouldn’t be any glaring weaknesses found in is overall performance. The Innova DX Dragon disc driver is made to accommodate new players. The DX dragon is especially well-suited to water hazard shots and tailwind drives that are commonly quite troublesome obstacles for players who haven’t yet developed enough raw skill to deal with them easily. Because the disc is particularly lightweight, it is buoyant enough to float on water. The material making up the disc is “extra grippe”, helping players maintain a firm-enough grasp on the disc for confidence and stability in their form and release. The driver’s stability classification is understable, so players can expect it to commonly veer off slightly to the right when thrown. 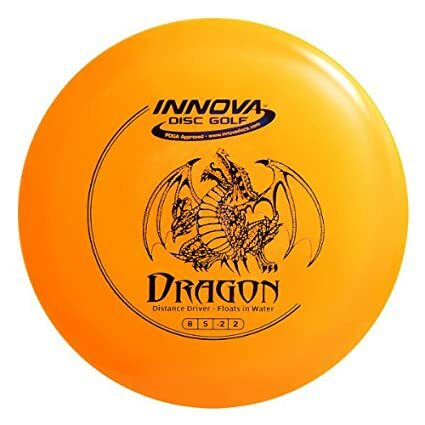 Customers testify that the Innova DX Dragon is a particularly well-suited for players who consider themselves power throwers. Most players find that the disc driver has a relatively predictable flight path with a mild fade. 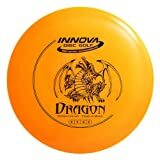 One player noted that the Innova DX Dragon has a tendency of diving like Russian sub whenever it’s thrown in a flat manner. The player noted that they got their best results when they tilted the disk down and focused on thrusting it forward as hard as possible. Because the disc floats on water, one owner reported that that they could reliably retrieve the disc from water hazards by using a 20 oz. plastic bottle tied to a cord to reel it back in. In addition to the easy water retrieval, the user reported that they were highly satisfied with how far the disc can fly with a relatively small amount of effort. Because the owner was admittedly an amateur when it came to their general level of experience with the sport, they found that the easy water retrieval was a particularly attractive selling point due to the chance that their throws might be slightly off the mark. The only downside mentioned by any of the testifying owners was the fact that they found the flight path to commit to the right slightly more than what they desired. The owner was interested in having a disc that would consistently fly straight, but with the DX Dragon, they found that their right backhands would almost always flip over with significant turnaround. All in all, the DX Dragon is best-suited for users who are most interested in a disc that that can counted on to consistently veer off to the right. Users who are interested in a disc that flies as straight as possible would be better off investing in a heavier disk with slightly less spinning action, but if this isn’t the case, then the DX Dragon has spinning action spare. Heavier discs tend to demand that the user put forth as much power and flex as they can to achieve significant height, but the DX Dragon goes far without needing to be thrown with much strength. Depending on the aerodynamics of a disc, it will take a certain flight path when thrown in a straight line. Discs that fly straight when thrown straight are called “stable”, discs that veer to the right are called “understable”, left-veering discs are classified as “overstable”, and some discs can be called stable-understable or stable-overstable if they don’t conform to one extreme. Before purchasing any disc, you should definitely have an idea of its stability level and intended flight pattern behavior in advance. Different discs will require a different level of power to travel the same amount distance. Your own style of play will have a direct impact on whether or not a high power-demanding or low power-demanding disc is ideal, so knowing the power of a disc before buying it is very important. The combination of power and stability will directly contribute to the accuracy with which the disc can be thrown. After getting a picture of how the power demand and stability of a prospective disc will interact with your playing style, you should have an accurate idea of how easily you could personally guide the disc to its intended mark. Aside from the stability and power, certain discs will have varying level of fade. The fade of the disc, rated from 0 (straight) to 5 (sharp hook) will determine how the disc ends its flight. Certain discs are simply better-suited to owners who have a higher level of experience with the sport in general. Players who are very familiar with the aerodynamics of different discs will be more capable of compensating for turnovers in mid-flight while maintaining good accuracy; less-experienced players, on the other hand, may be better off mainly sticking with drivers that have stable flight patterns until their depth perception and coordination for the sport have developed further. Because of how simple a disc gold driver appears at a glance, it can be quite easy to underestimate the high number of subtle aerodynamic factors that differentiate one driver from the next. If you want to ensure that your driver is a successful fit for your particular playing style, then it’s imperative to know what its stability classification, gliding power, and fade tendencies are. Once you’ve gotten the dynamics of disc golf drivers down to a science, you’ll be able to seamlessly execute throws in a much more accurately than before.